On Monday, we as a nation will celebrate Dr. Martin Luther King, Jr. Day. I thought it would be good that we, again, listen to the words of Dr. King from his “Letter from a Birmingham Jail.” This excerpt, found in the later part of that marvelous and challenging letter, asks a simple but profound question: “What kind of people worship here?” Are we a people of the Gospel that comforts the afflicted? Are we a Gospel people who stand with those on the margins? Are we a full Gospel people? “Yes, these questions are still in my mind. In deep disappointment I have wept over the laxity of the church. But be assured that my tears have been tears of love. There can be no deep disappointment where there is not deep love. Yes, I love the church. How could I do otherwise? I am in the rather unique position of being the son, the grandson, and the great grandson of preachers. Yes, I see the church as the body of Christ. But, oh! How we have blemished and scarred that body through social neglect and through fear of being nonconformists. “There was a time when the church was very powerful–in the time when the early Christians rejoiced at being deemed worthy to suffer for what they believed. In those days the church was not merely a thermometer that recorded the ideas and principles of popular opinion; it was a thermostat that transformed the mores of society. Whenever the early Christians entered a town, the people in power became disturbed and immediately sought to convict the Christians for being ‘disturbers of the peace’ and ‘outside agitators.’ But the Christians pressed on, in the conviction that they were ‘a colony of heaven,’ called to obey God rather than man. Small in number, they were big in commitment. They were too God-intoxicated to be ‘astronomically intimidated.’ By their effort and example they brought an end to such ancient evils as infanticide and gladiatorial contests. Things are different now. So often the contemporary church is a weak, ineffectual voice with an uncertain sound. So often it is an archdefender of the status quo. Far from being disturbed by the presence of the church, the power structure of the average community is consoled by the church’s silent–and often even vocal–sanction of things as they are. This entry was posted in Franciscan, Musings and tagged Letter from a Birmingham Jail, Martin Luther King Jr by Friar Musings. Bookmark the permalink. 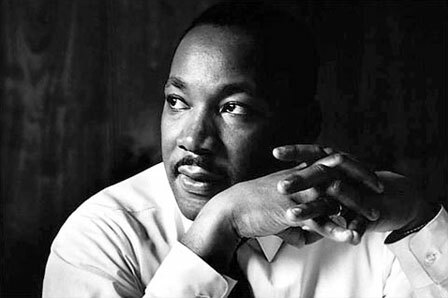 In reading Dr. King’s words just now, they reminded me of another time where a man of peace was put to death, too. Will they both be seen as a “mocking bird” of their times. Both spoke of peace, taking care of those less fortunate. Centuries and decades later their words and lives still have meaning. One our Savior and the other trying to show his fellow man that all are God”s chilren. May we always remember Dr. King as a person who cared a great deal for his fellow man. And, may we never forget Christ, our Savior.